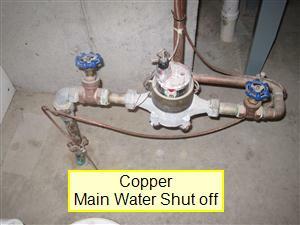 Copper: The most commonly used main water supply line found today. Lead: The easiest way to distinguish a lead water supply line is a distinctive “bubble” in the line, typically next to the meter. Galvanized Steel: Found in most older homes, galvanized steel was used as a main water supply and was also used for the main water lines (leading to all the faucets in the home). Black Polly: Commonly used today as a main water supply for homes with a well. 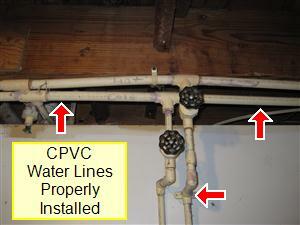 CPVC: The most unlikely water line used today. 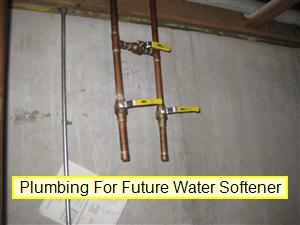 It is primarily used by homeowers that are installing their own water lines (leading to faucets). Pex: A plastic like material that is becoming more commonly used today for the main water lines (leading to all the faucets in the home) because of the high cost of copper, and dueto the fact that it is easier to install. 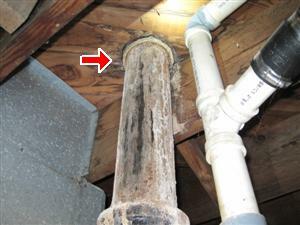 Galvanized water lines are generally only found older homes, they have been found to have the problem of corroding from the interior, stopping water stopping from going thru your home. 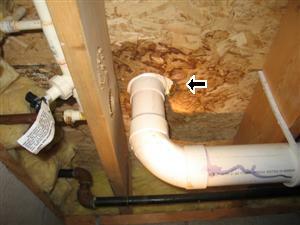 CPVC Water lines these are generally used when home owners do there own plumbing. 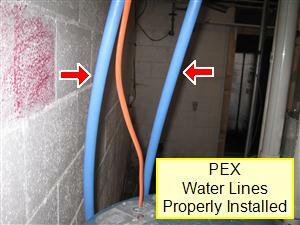 PEX water lines are generally found in red and blue, they are used more today because of the cost of copper and how easy it is to install in a new or existing home. 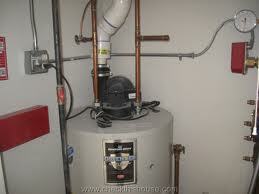 Black poly main water supply, commonlyused with a well pump system. Water leaks in all the joints. 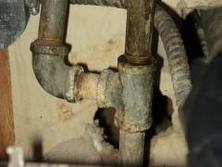 Water leaks in all the shut off valves. 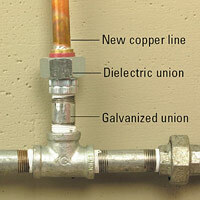 When Galvanized and copper pipes are connected together they should have a Dielectric union Pipe fitting installed. 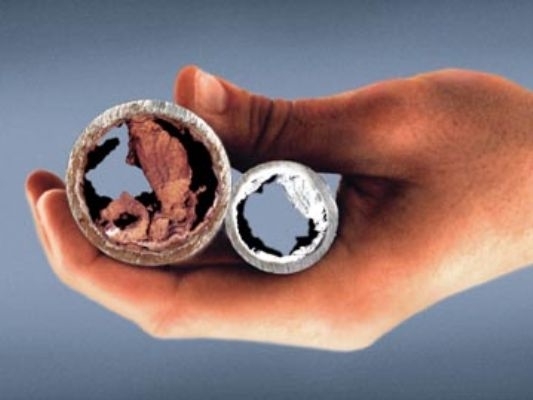 A dielectric union pipe fitting is designed to hold together two different types of metal. Galvanized lines that run horizontally through the house have the tendency to build up rust and create water flow blockages. Run at least 2 faucets at the same time and check the water pressure to determine that the pressure is adequate. Two dissimilar types of metals that are connected together (such as copper and galvanized steel) should always have a dialectic union installed to prevent corrosion. 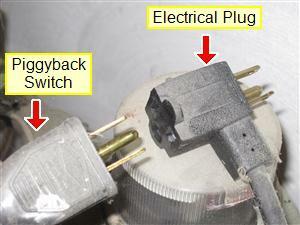 The water heater lines were properly installedusing dielectric unions. Dielectric unions areused to connect to different types of metal,copper and galvanized. 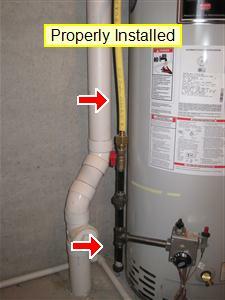 High efficiency hot water heater: the easiest way to determine if the unit is high efficient is if the exhaust vents out the side of the home using PVC plastic pipe. 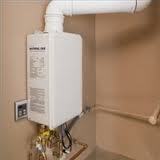 Tank less hot water heater: the newest form of heating hot water in homes today, it is a much smaller unit that is attached to your wall of your home. 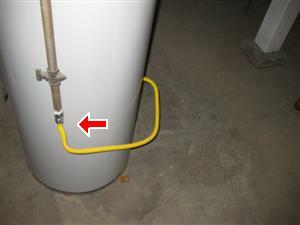 White PVC Exhaust pipes represents a high efficiency water heater. 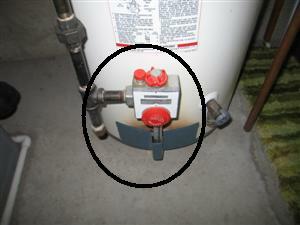 The hot water heater is producing hot water. 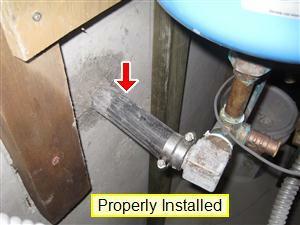 The T&P or pressure relief valve has pipe that is extended 6″ from the floor. 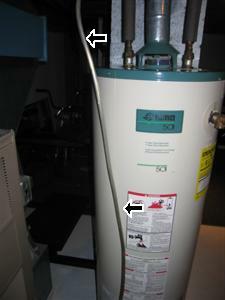 The hot water flu should be properly connected using a minimum of three screws per joint. 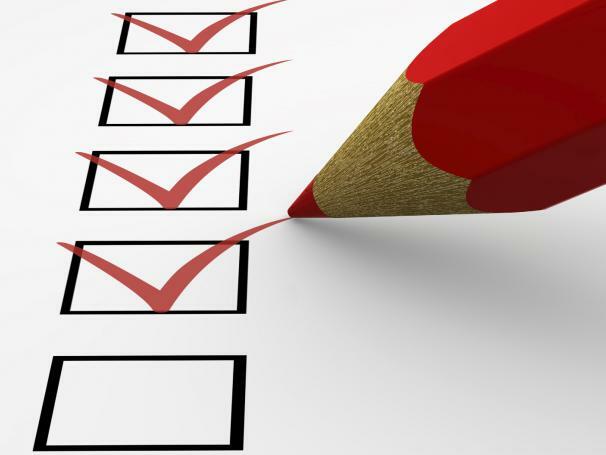 All hot water heater flues that are run into a chimney should be properly connected not allowing carbon monoxide to re-enter the home. 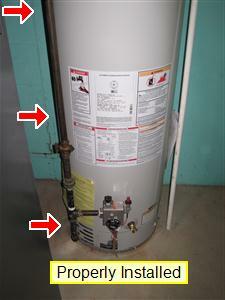 Listen for a gurgling sound coming from the hot water heater, this is a indicator that the hot water has sediment build up at the bottom of the inside of the tank and the hot water heater is nearing the end of its useful life. 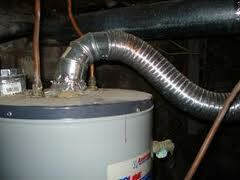 Many hot water heaters are normally installed by the home owner and are not always vented properly. 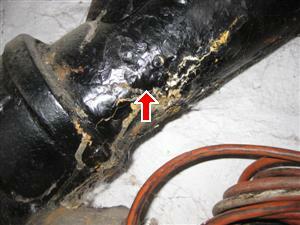 We recommend to check with local plumbing inspector for venting inspection. 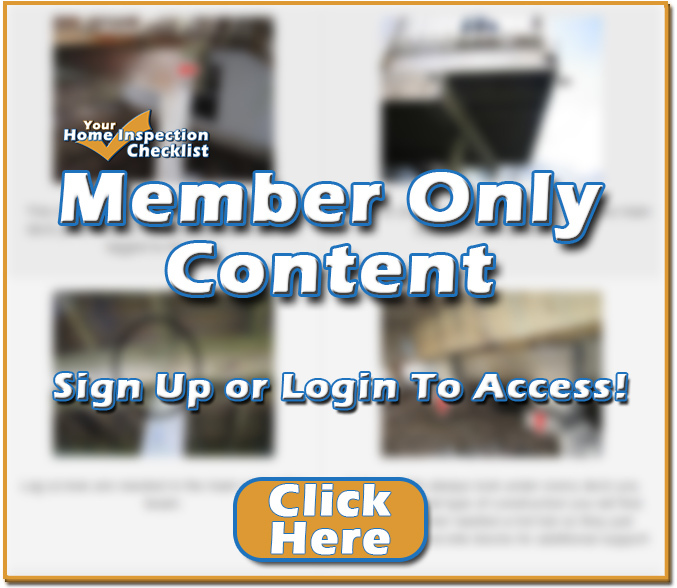 Make sure the draft hood is securely connected to the hot water heater. 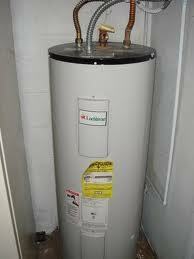 Make sure the hot water heater flu has positive air flow to the chimney or the roof. If a hot water heater is installed in a closet and is not a high efficiency unit we recommend it have louvered doors as well as a vent coming in from the exterior of the home to provide ambient air (these are normally a metal vent). 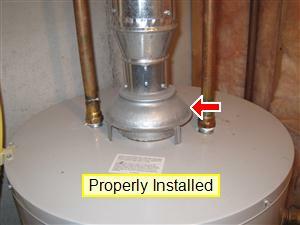 Properly Installed Hot Water Exhaust.The next 5 photos will indicate different ways a hot water flu should not be installed. 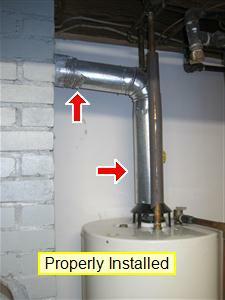 This water heater exhaust line has been properly installed by running a new metal liner up the chimney and cementing around the water heater flu for safety, to eliminate the chance of carbon monoxide coming back into the home. 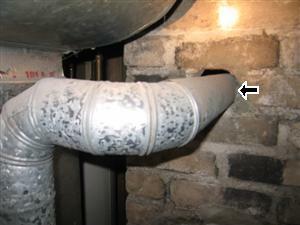 Improper exhaust using dryer vent material. Exhaust should have a positive upward draft, not a downward flow. 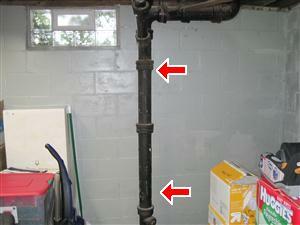 This exhaust is a safety hazard and professional should be called in to repair. 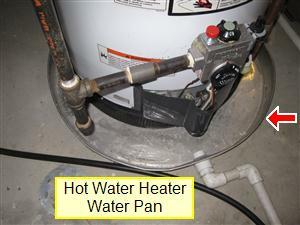 This hot water heater has been run in a soft metal line which is flexible and can be bent or kinked/broken. 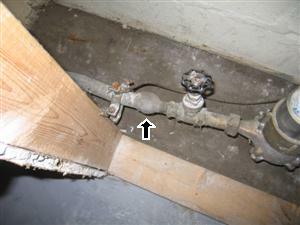 The two photos to the left indicate properly installed gas lines. 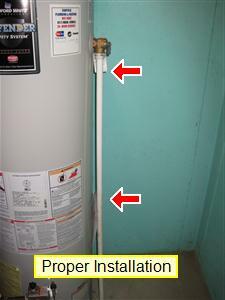 This is another of photo of a Hot Water Heater that the gas line was not properly installed,we recommend to have professional contractor make all necessary repairs. 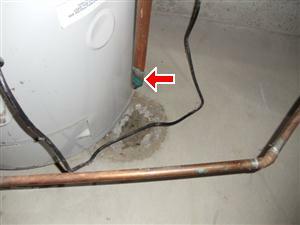 The hot water heater is leaking water from the drip pipe, the T/P valve is possibly going bad and should be checked by a licensed plumber. 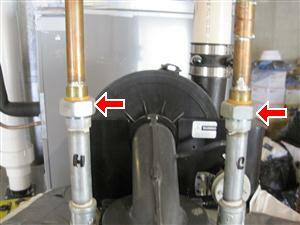 The photo to the left indicates a T/P valve with no drip pipe attached to it. 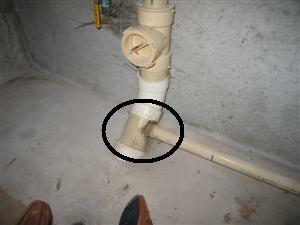 Missing drip pipe (safety hazard) Drip pipe should extend down to 6 inches above the floor. We recommend using a copper or pvc pipe. 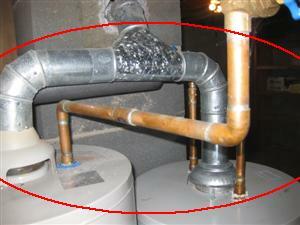 This hot water is a photo of a drip pipe that has been properly installed. 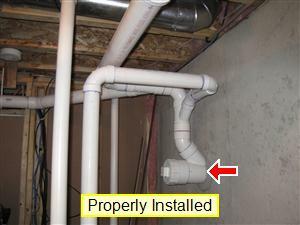 Drip pipes are often seen run in either pvc as this one is or a copper pipe. 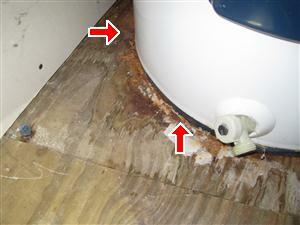 This photo indicated rust a the base of the hot water heater, after looking at the unit closely we found their was a slow water leak. 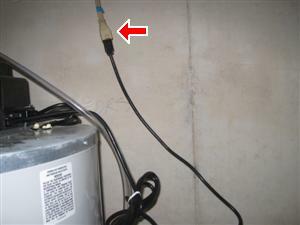 A High Efficient water heater always uses a power vent which needs electricity, we don’t recommend running a extension cord for your water heater like this one has above. 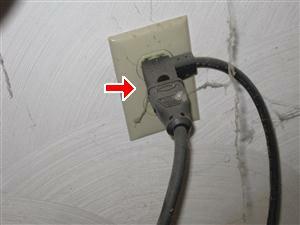 We recommend to hire a licensed electrician to have a dedicated outlet installed. 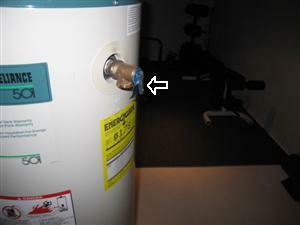 This water heater has signs of burning at the base of the heater, this is caused by what is caused back drafting (safety hazard)we recommend to have a licensed heating or plumbing contractor check the unit. 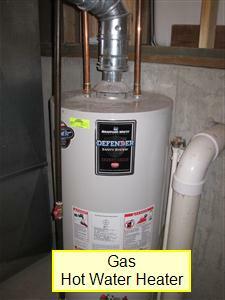 This is a photo of a hot water heater pan, we recommend that every water heater that is placed on the main floor or second floor of a home have a water heater pan installed. PVC: Most commonly found in new homes today, PVC is white in color and the size that is normally used today for main waste lines is 3″ to 4″ in size. PVC is also used for interior waste lines coming from your kitchen and bath, these lines are nomally 2″ to 2 1/2″ excluding toilets which will normally be 3″ to 4″. 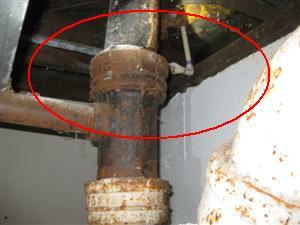 These types of pipes should have a long dependable life if not damaged. Galvanized Steel: Found in older homes and has a life expectancy of 50 to 75 years, we recommend to look closely at the pipes for areas that are rusting and my cause future problems. Copper: A high quality pipe that was used in the 1950’s to 1960’s. 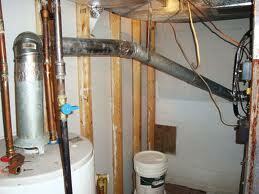 Copper was commonly used for drains in bathrooms and kitchens. 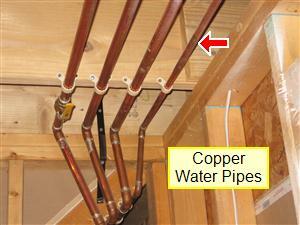 Sometimes you will find the main waste lines installed in copper. 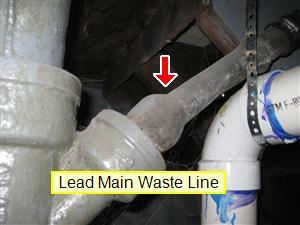 Lead:Mainly used in older homes and commonly found mainly for traps under sinks and baths. Black Cast Iron:Commonly found in older homes, we have found that this type of pipe could last anywhere from 50 to over 100 years. 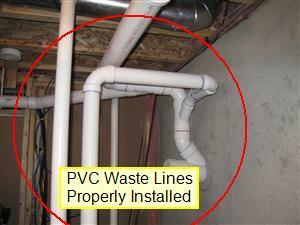 The white pipes are called PVC they are commonly found in newer homes and used for the main waste lines and drains. 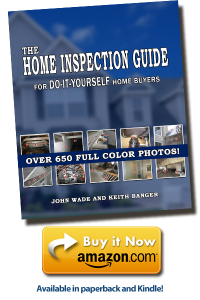 When you see a plumbing waste line that is installed half way up the basement wall and is running to the exterior of the home this generally indicated that the home has aseptic system. 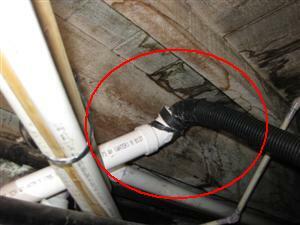 Sometimes in older homes you will see the same thing but the system has been converted to a city sewage system. What you are looking at is a above ground lift station, this type of unit is generally only in homes where they have been re modeled,and it is much easier to install this type of unit rather than cutting into the concrete and running a new waste line. Look very closely at all cast iron and galvanized lines for severe rusting (remember this material is very old). We recommend that you run all the water in the home for a few minutes including flushing all the toilets and look very closely under all the waste lines in the basements for leaks. It is also very important to look at the ceilings on the main floor of the home where there is a second story directly under all bathrooms. Look for water stains or drywall/plaster repairs. Water leak under the bathroom toilet. 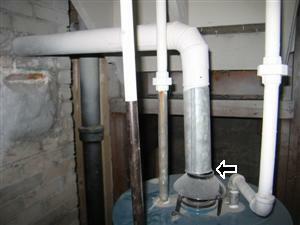 Make sure you flush every toilet in the home then go down below and check for leaks. Water leak under the bathroom tub found in the basement. 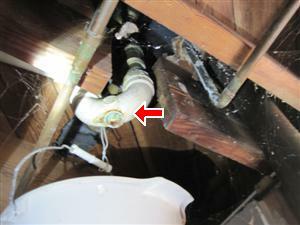 It is common to find leaks under the bathroom tub so you have to run the water in the tub and shower then check for leaks below. Make sure you don’t walk from the tub / shower when running the water in case of a leak you are not aware near the tub or shower area. 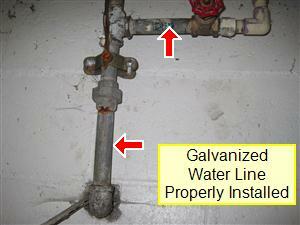 Photo of galvanized water line. A sewage injector pump is used as a lift station for your bathroom waste, when you see one of these pumps you should always see two waste lines coming out of the system, one is waste and the second will run to the exterior of the home for venting. This pump can be tested by flushing the toilet or running water (typically for a couple of minutes) and then listening for the pump to engage. Once it does you will know it is operating. 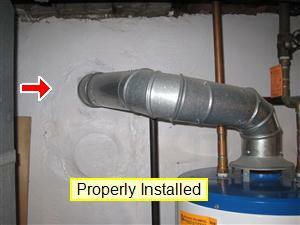 The cover needs to be sealed around the pipes to prevent sewage gas from escaping. A sump pump is found in many different houses for different types of applications, but most commonly used for ground water and for lifting laundry or grey water up to your plumbing system. 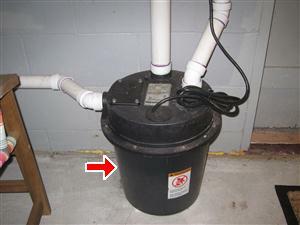 Grey water (waste laundry water) that runs into a sump pumps should be pumped back up into your main waste line. That waste line can be either a city waste line or a septic waste line. 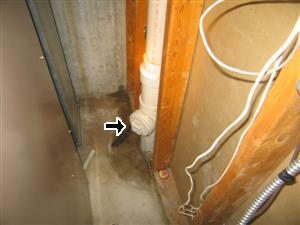 Drain tile waste lines should only be pumped from the sump pump to the exterior ofthe home. We recommend turning the pump onto test. 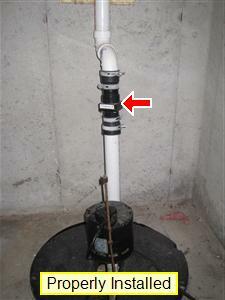 This sump pump has been properly installed using a back flow preventer which the red arrow points at. 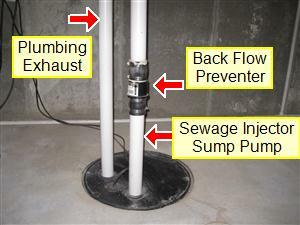 We recommend that all sump pumps have back flow preventers installed. 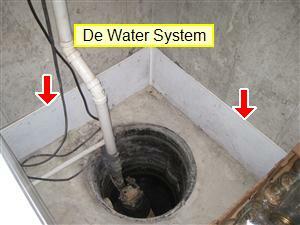 This is a sump pump that was installed with a de-watering system for the basement. A de-watering system properly installed will divert water from entering the basement and feed into a sump pump then be lifted out and away from the home. 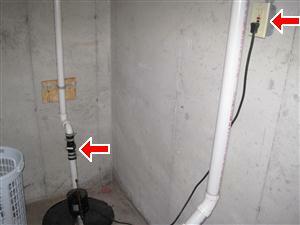 This sump pump was installed properly but was wired to a GFCI outlet which we do not recommend. 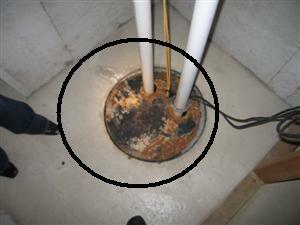 If the GFCI outlet trips, your sump pump will not operate. This is a sump pump plug. This is the same sump plug that you see to the photo on the left, when you see this kind of plug it allows you to unplug the two plugs from the wall, then unplug the the piggyback switch from the electrical plug and plug the piggyback switch into the wall and test the sump pump.